Survolez Trakai lors d'un vol en montgolfière comprenant un toast au champagne après votre retour sur terre. 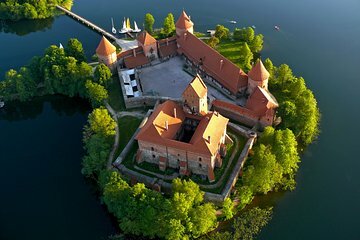 Le vol est conçu pour prendre le château de l'île de Trakai sous un angle que peu de visiteurs connaissent, avec des vues qui s'étendent sur une partie pittoresque de la remarquable campagne de Lituanie. Crew were friendly , the pickup was ontime . The experience was very smooth and amazing! Absolutely amazing! Professional, on time, friendly and experienced crew happy to explain everything to make your experience really really unforgettable! Plus of course the flight itself was gorgeous 3 Thank you for everything I 100 recommend this tour! We were on a group trip that included a similar hot air balloon flight Vilnius is the only European capital which allows the flights over the city proper. But since we were coming in earlier, I booked this trip for the first time available. The flight was washed out, as were several earlier flights. The next morning was also a no go. But the evening cleared up and eight balloons were lined up to go, as it was the first opportunity in a while. We went, my wife and I and two other couples, and had a wonderful time. Lots of families with small children came to play in the downtown park and watch the balloons. We had a great trip. We got there about 7:45 PM, took off at 8:45 PM and had an hour or so flight. Back at the hotel around 11:00 PM. Highly recommended. Note also that all other flights for the week were washed out by bad weather, so our planned group trip did not happen. I would also be remiss if I didn't mention Discover Lithuania and our guide Andre, who provided several other sight-seeing services for us. He coordinated with repeated phone calls the hot air balloon schedule, a special restaurant game dinner I had booked, and the day tours. He did all this even though the tours were booked seperately, not through him. We ended up flying over Old Town I was a bit disappointed but quickly forgot about the castle once we were up in the air and the captured by the moment. Our pilot Arturus is a new personal hero of mine, he emits boss levels of zen. We first landed in a field occupied by an older women who wasn't frilled to have unannounced company but the cool captain took to the skies again after sweeping past some treetops he gracefully landed us in a beautiful meadow. Amazing trip. All the correspondence I had with the team was on point.